Mark Mulhall and John Hough are two photographers on a mission. They may not be trying to save the world, but they are doing everything in their power to save historic theaters throughout the United States and beyond. But how can two photographers, armed with nothing more than talent, a camera, and bold intentions, succeed in such a mission? 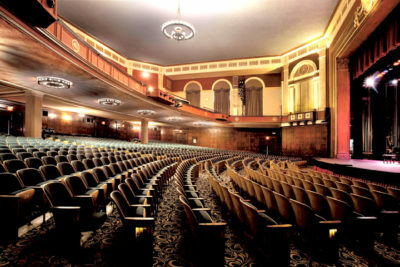 Both members of the Los Angeles Historic Theatre Foundation, Bay Area Historic Theatres and Theatre Historical Society of America, Hough and Mulhall realized that most theaters have never had their palace-like interiors thoroughly documented by professional photographers. Out of their love for these notable grande dames, the two decided to volunteer their services through their organization called Ornate Theatres. Once the theaters have been photographed, Hough and Mulhall hand all of the photographs over to the theater owners to use as they wish. “By getting these pictures out there, hopefully more people will get involved and raise the social consciousness of their existence,” explains Mulhall. Up to this point, the Los Angeles residents have photographed dozens of historic theaters around the country, including the Paramount Theatre in Oakland, the State Theatre in Cleveland, Ohio and the Erie Playhouse in Erie, PA. Locally, they have documented the United Artists Theatre at the Ace Hotel, the Chinese Theatre on Hollywood Blvd., the Alex Theatre in Glendale, the Spreckels Theatre in San Diego and many more. They would like to start travelling internationally as well. On the day that I caught up with them, they were focusing their lenses on the historic Wilshire Ebell Theatre on Lucerne and 8th St. The theater, with a seating capacity of 1,266, has a rich history. Hough, who has been snapping pictures for decades and counts real estate photography as his day job, loves being able to use digital cameras to capture the architectural aspects of the theater spaces. “It’s like you can stand in the middle of the room and look around you at the entire space,” he explains. In order to continue on their photographic crusade, the pair has turned their organization, Ornate Theatres, into a nonprofit. They are hoping that through corporate and individual donations, they will be able to travel to as many of the world’s historic theaters as possible, before time runs out. To learn more about Hough and Mulhall’s project, or to donate, go to ornatetheatres.com.